Spherical aberration is an optical effect occurring when the oblique rays entering a lens are focused in a different location than the central rays. The distance in this focal shift is dependent on the depth of the focus in the specimen. ZX (optical axis horizontal) slice of a lens with spherical aberration. In microscopy, the main cause of spherical aberration (SA) are mismatches between the refractive index of the lens immersion medium and specimen embedding medium. When light crosses the boundary between materials with different refractive indices, it bends across the boundary surface differently depending on the angle of incidence (Light Refraction): oblique rays are bent more than the central rays, and therefore the focusing is spoiled. If the mismatch is large, e.g. when going from oil Lens Immersion Medium into a watery Specimen Embedding Medium, the Point Spread Function (PSF) will become asymmetric at depths of already a few micron. In relation to deconvolution, SA is especially harmful for Wide Field Microscope deconvolution. XZ (optical axis vertical) slice through the focus distribution of a Numerical Aperture = 1.3 lens. Left: no spherical aberration; right: imaging into a medium with refractive index 1.4 at a depth of 10 micron. See more detailed illustrations in Mismatch Distorts Psf. Workaround: keep the Z-range of the data as small as possible. Solution: use a lens with an immersion medium with a Refractive Index that matches that of the preparation. (In the case above a watery Lens Refractive Index is needed). Huygens Software adapts the theoretical Point Spread Function (PSF) to the sample depth to correct for spherical aberration while Doing Deconvolution. If your microscope is well aligned and its PSF fits the ideal models quite well, you can use theoretical PSF's only. This will make use of a depth-dependent PSF. If the measured PSF is far away from being good (i.e. it is very dissimilar to the theoretical one in size or symmetry) then better use this one. It will take into account all the microscope misalignments. If your sample is not very thick, a depth-independent experimental PSF will do it as well. You can use the PSF generator in the Nyquist Calculator to simulate spherical aberration conditions at different depths inside the sample, and compare the results with your experimental PSF. If you are not sure what the orientation of your dataset is you can always guess it from the asymmetry of the PSF of the cones of light. 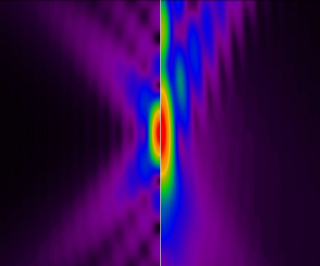 See Mismatch Distorts Psf. To switch the SA correction off (because despite the refractive index mismatch you have other physical correctors in your setup) just set the image Microscopic Parameters to have matching Lens Refractive Index and Medium Refractive Index prior to DeConvolution. Air lenses require special consideration: they may be corrected for spherical aberration and they may behave as, e.g., glycerine lenses, and therefore you will not expect problems if you use glycerol as embedding medium. You can then think about deactivating the SA correction as explained in the previous paragraph. Still a Fishtank Effect may be present that will make things difficult. Read more in Air Lens Correction. Read more about this correction in Parameter Variation.